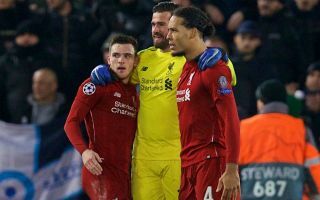 Liverpool left-back Andrew Robertson has earned huge praise from pundit Garth Crooks as he called the Scot the best left-back he’s seen since Ashley Cole. Given that the former Chelsea and Arsenal man is one of the finest full-backs of his generation, that’s some compliment to Robertson, who really has been superb for Liverpool again this season. It’s strange to think now that the 24-year-old was a fairly low-key Reds signing from Hull City last season, and didn’t even feature regularly in Jurgen Klopp’s side for the first few months of the campaign. Since then, Robertson has come on leaps and bounds to surely make himself one of the first names on the team sheet at Anfield. Crooks was hugely impressed with the Scotland international once again this weekend, putting him in his team of the week and paying him the ultimate compliment by comparing him to Chelsea great Cole – a Premier League, Champions League and FA Cup winner in an outstanding career that Robertson would no doubt love to emulate. ‘I just love watching this kid play,’ Crooks wrote on BBC Sport. ‘Apart from anything else, he has nerves of steel. The ball he played for for Georginio Wijnaldum to score was just wonderful and the side-foot volley when Sadio Mane should have scored was just sensational.